Recent RPI Masters of Architecture graduate Henry Miller has devised a way to reuse waste plastic as an aggregate in cement, circumventing the energy-intensive process of plastic recycling. By grinding up landfill-bound plastic and mixing it with portland cement, Miller was able to create a material just as strong as traditional concrete made with mined aggregate. The ingenious solution netted miller first place in the “Component Category” of the second annual Concrete Thinking for a Sustainable World competition. Using recycled materials is so hot right now, but using them as aggregate is hotter than Hansel in a black shirt on a summer Sunday. While living in Albany, Miller saw many areas cut their plastic recycling programs for the cheaper (now) solution of landfills, and noticed the astounding number of brownfield sites that were simply being abandoned. Miller’s idea: Why not use plastic waste as an aggregate in concrete and create a more sensible product. 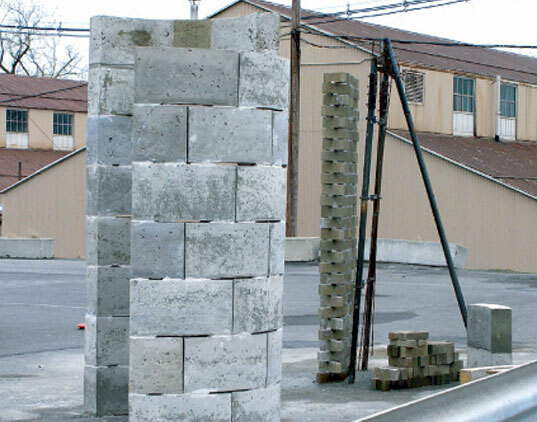 By mixing together ground-up plastic with cement and soil reclaimed from the brownfields, Miller was able to create a material just as strong as conventional concrete. The Concrete Thinking for a Sustainable World competition only asked students to conceptualize a design, but Miller he was not satisfied with a mere idea. He actually used his plastic concrete to build a screen and a wall. In doing so he showed that his ideas were viable alternatives to the status quo and that there was no excuse to merely fall in line. Yes but is it fire-resistant? Does it give off fumes? This is a brilliant research. Would you please send me information on combination ratio(components),procedure and advantages/disadvantages against ordinary bricks.Looking forward to your kind reply. what s the increase in strength using plastic as aggregate? proportion ? practically applied? Sir, can you please give more details on how you attained your cement/sand/plastic ratio. I would really like to know how you did your mix..Hope to receive your reply. I would really like to know what the cement/sand/recycled plastic ratio is. Please help me with that. This is a very wonderful invention of Miller. all this is good but 1) is it really fire resistant? 2) what is the approximate production cost? sir,i want to know the mix design of Plastic Concrete: Building Bricks Made From Landfill Waste. Waterproof cement overcoating of the plastic composit blocks for ground contact and fireproofing works just fine. Shredded Type 1 through Type 7 plastics all work. We make them in Belize from 1/2' "Type 1 PETE flakes and sand. The cheapest chemical bonding agent is still more costly than portland cement. . I agree with Seamus... I had the same thought, wondering how stable the wall would be when the plastic bits got hot and melted away. The compressive strength can't possibly be the same after that. This is possible now and is being used now. The problem with this product is that it is unable used on the ground, because the granulated plastic leaches into the environment. Big no no with the EPA. So if the new structure is mostly a polymer instead of a mineral. How fire resistant is it now? Beyond the basic durability and structural advantages that come from mineral, stone, brick, and concrete construction. You have the excellent thermal properties that come with it. For some reason I envision buildings going up like roman candles that are built this way. Beyond 2000 showcased something like this back in the 90s. Of course the developer was in Australia and I haven't heard of it catching on here. I wonder what the difference is in weight compared to traditional concrete? And what about R-value? I hope he pursues this viable idea and we see it on the market in the near future. The fact is, we produce way to much plastic, making it one of our top waste products and a total blight to nature. Recent RPI Masters of Architecture graduate Henry Miller has devised a way to reuse waste plastic as an aggregate in cement, circumventing the energy-intensive process of plastic recycling. By grinding up landfill-bound plastic and mixing it with portland cement, Miller was able to create a material just as strong as traditional concrete made with mined aggregate. The ingenious solution netted miller first place in the "Component Category" of the second annual Concrete Thinking for a Sustainable World competition.